Good morning friends! I have a treat for you today. Since I am basking in the Arizona sun this week with Mr DIY, I've asked my friend Ashley from 3 Little Greenwoods if she would share a project with you today! Ashley was one of the very first 'bloggy' friends I made. She is super sweet...and super talented! No one else can pull together a kids birthday party better than Ashley! Her site is full of fun and colorful inspiration for your home and I hope you'll check out her blog. Take it away Ashley. Hey, everyone! I’m Ashley and I blog over at 3 Little Greenwoods. At 3 Little Greenwoods I love sharing all sorts of easy crafts, DIY home decor, effortless entertaining tips and Southern recipes. 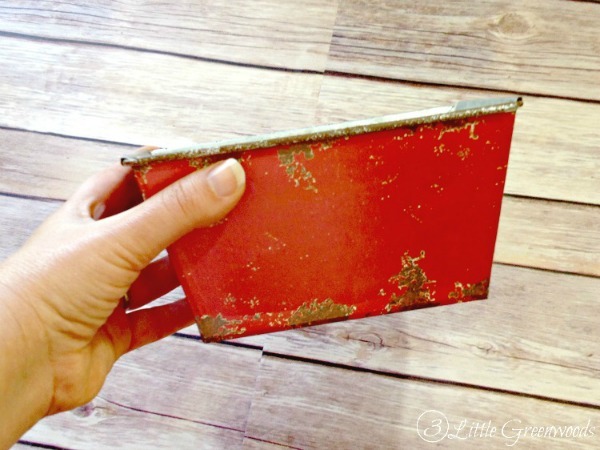 I am so happy to be at DIY Beautify for my first guest post! 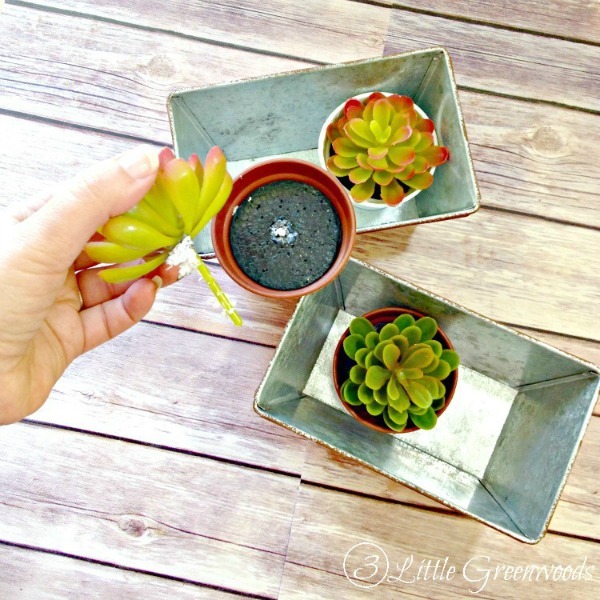 Today I am excited to share How to Pot Faux Succulents so they look real! 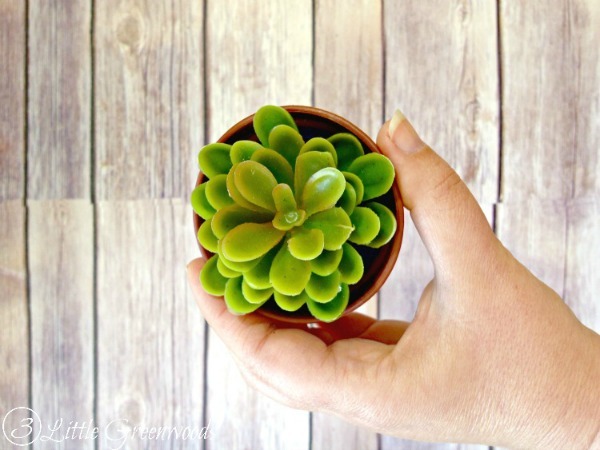 This is an easy, inexpensive DIY that will add a pop of green to any room in your home. 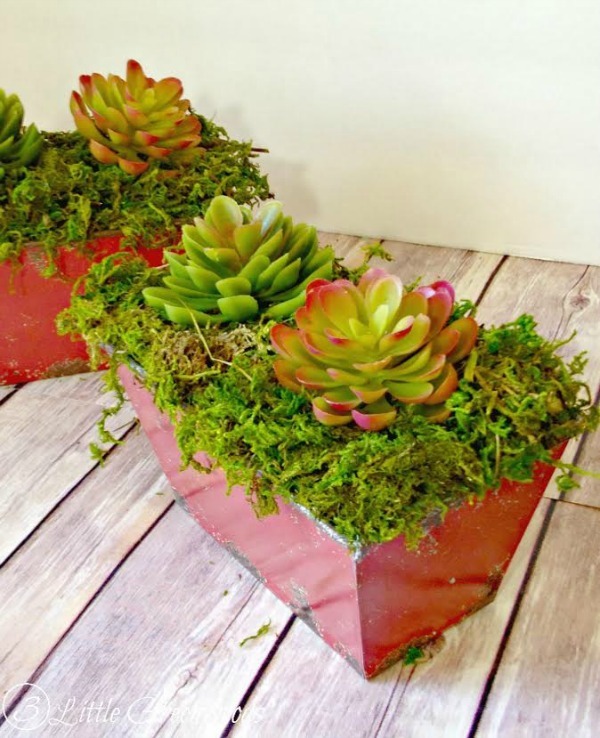 Finding faux succulents for this project will be easy. Many craft stores carry a lovely variety of succulents. I found mine at the Dollar Store! The container I chose came from my favorite craft store. With the 40% coupon it was less than $3! I love the color and it's chippy paint. 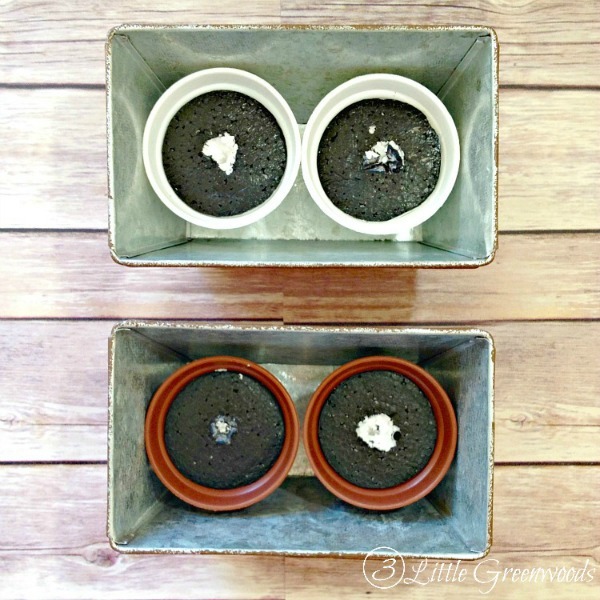 Begin by carefully removing the faux plants from the original plastic pots. Place the empty plastic pots inside the container. This will help to fill up the space so you do not have to use so much floral foam. Use a serrated knife to trim the floral foam to fit inside the container. Push the foam down firmly to secure. 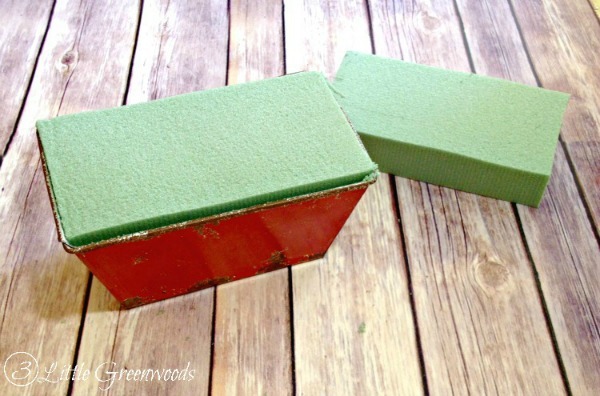 Use hot glue to cover the floral foam with green moss. Add the faux succulents to the top and you are done! The finished succulents add a lovely pop of green to my kitchen sink. Since they aren't real I don't have to fuss with trying to keep them alive! 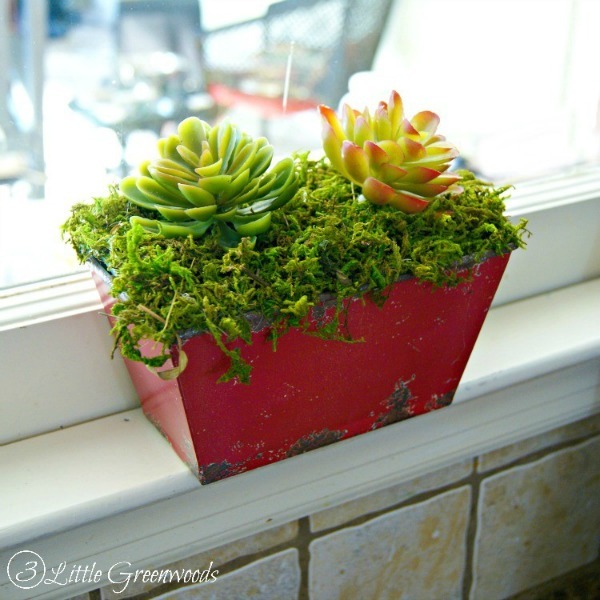 If you loved learning how to pot faux succulents then you will want to see the entire Kitchen Sink Update! 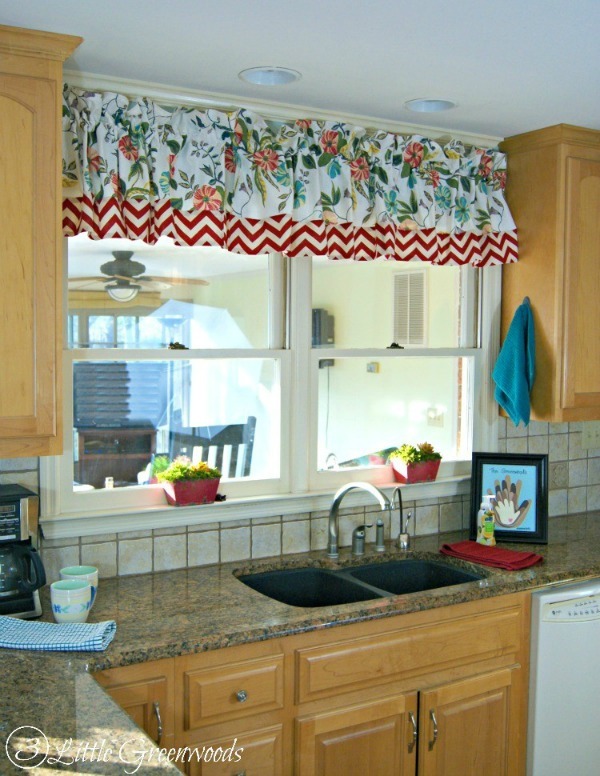 Click here to see how no-sew curtains and a few simple DIY projects helped to pretty up this very busy spot. 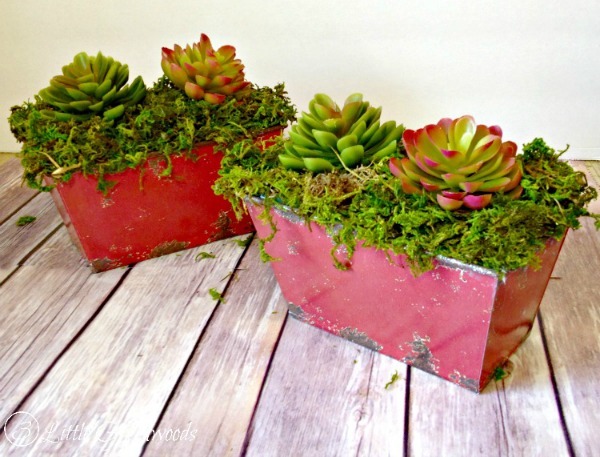 Thanks so much to Cindy for allowing me to share my How to Pot Faux Succulents tutorial with you! I hope you have been inspired to add a few of these to your own home. Meanwhile, I would love for you to come hang out with me over at my blog! You can find me over at my blog 3 Little Greenwoods or connect with me on social media. Thank you so much Ashley! This is a project I'm definitely going to have to do because as talented as I am, lol, I cannot keep succulents alive! My African Violets have fared better than the succulents I've tried to grow! Like I said earlier, I'm in Arizona this week, hopefully getting a lot of sun and rest! I will still be posting on Thursday for Week 4 of my One Room Challenge. I had to do all the work on my Guest Bedroom Makeover in advance so I could enjoy my trip! Here's a little hint of what to expect...driftwood. Hope to see you then!